I know, it’s a big conference-type hotel. But we were going to a conference, and while we could have chosen a different option (boutique hotel, rented apartment), there’s a lot to be said — especially early in the morning and late at night — for a hotel that’s only steps away from the conference center. Happily, it turned out that the stay we had at the Fairmont Waterfront could not have been more pleasant, especially from Chloe’s point of view. I should mention that I paid for this hotel stay — I’ll always let you know when something I’m reviewing has been paid for by someone else. Our room was on the 4th floor, and the elevators moved snappily, so getting outside for Chloe’s morning walk was blessedly rapid. The room was attractive in itself (pewter/silver/muted gold decor — so subtle, in fact, that it took me a while to notice and appreciate it), and it had a good view of Coal Harbour, including the departures and arrivals of the SeaBus. The hotel provided two stainless steel bowls for Chloe’s use, along with a bed that was close enough to new that it pleased me, and comfortable enough that Chloe actually used it. They also provided a couple of packets of locally-made dog treats that turned Chloe inside-out with joy (more about those in a moment). Our room, with Chloe stranded on the credenza (she wants to be on the bed, but has to wait until I throw a dropcloth over it). Her crate’s in the tote next to her, waiting to be unpacked and set up. Chloe installed in the comfy bed the hotel provided for her use (they also provided those bowls). Crate now set up, with travel tote and food kit resting on top. The Fairmont Waterfront is located directly across the street from Canada Place and the Pan Pacific Hotel, and at an angle across the street from the conference center and the beginning of the Seawall, a great place to start a dog walk. It has to be admitted that there’s a dearth of grass near the Fairmont Waterfront — you can find some a short walk away down the Seawall — but Chloe, thankfully, doesn’t require grass. The FW is also nicely located for easy walks downtown, to Stanley Park (a longer but doable walk), and to Gastown and Chinatown. The only flaw I experienced was the room service breakfast omelet (really, I should have known better). There is a very basic food court on the concourse level, however, and I was perfectly happy with a morning Egg McMuffin (don’t judge!) and a Starbucks coffee (hey! don’t judge!). I do draw the line at TacoTime, however, so I was relieved to find Arturo’s, a competent Mexican food truck, parked at the corner of Cordova & Howe every afternoon for lunch. Since we’re speaking about food, I can also report that the hangar steak on the menu at the hotel restaurant (recently renamed The Arc) was so good that I had it five nights in a row. Vancouver is full of good food, I know, and I should have sought it out, but by dinnertime I was pooped from exploring the city. 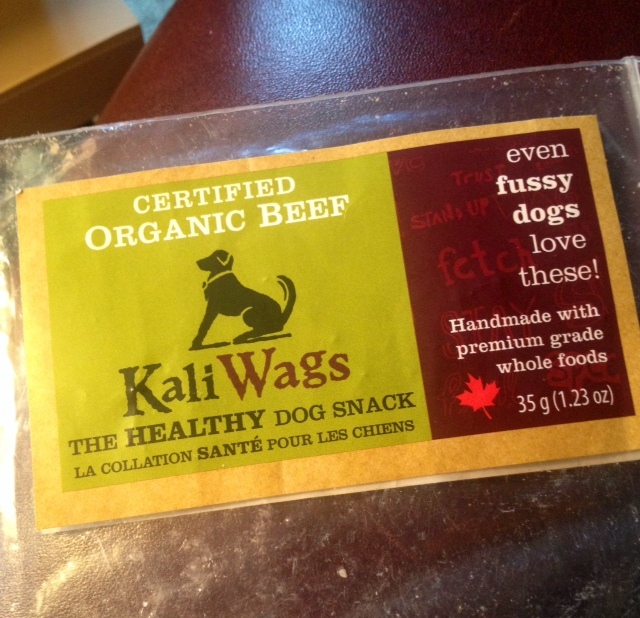 Food brings me back to the topic of those packets of Kali Wags treats the Fairmont provided for Chloe. The staff at the front door had them too, and Ryan, in particular, adopted Chloe as his own. It only took one treat-packed love fest for Chloe to start pulling at the leash as we rounded the corner, and by the end of our week she was approaching the hotel at a gallop. Ryan fell into a routine of walking her into the lobby and handing her off to one of the front desk staff, all-female during our visit — who would click out in heels and immaculate outfit and hurl herself onto Chloe. Every staff person we encountered, in fact, was unusually kind to Chloe (and to me, but that’s not my main measure of a hotel these days!). There are other hotels on the TED conference list (and they include another Fairmont hotel), but we have already signed up to return to the Fairmont Waterfront in 2015, it was that positive an experience. Why mess with success? 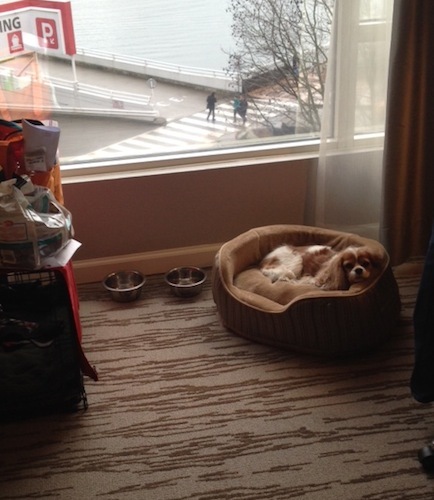 The Fairmont Waterfront isn’t inexpensive, but the pet fee ($25/night) is tolerable. The valet/self parking fee is heinous, however, so I recommend parking elsewhere, or doing without a car altogether. After a week of taking public transit (with Chloe, of course), I can report that it’s useful and clean and felt safe. 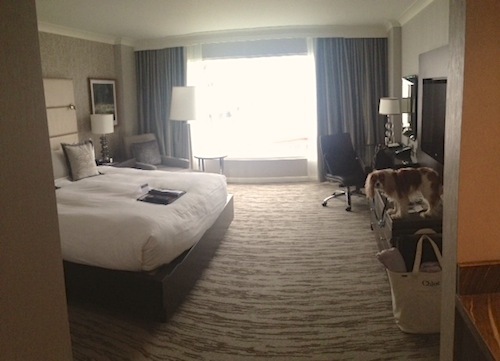 Another year, another TED conference, and we did indeed return to the Fairmont Waterfront. It’s still just as described here — and Ryan (and colleague Robert) are still manning the front door with treats and kindness. One change is that the KaliWags treats are a thing of the past, but Chloe was perfectly happy with the Zuke’s treats that have replaced them. Another change is that the Arc restaurant, just getting on its feet last year, has now hit its stride, and the hotel restaurant food is really delicious. Local, too — we were greeted with a packet of smoked salmon “candied” in honey from the hotel’s rooftop hives, and the same honey appeared on the dinner menu (e.g., in the roasted carrots). 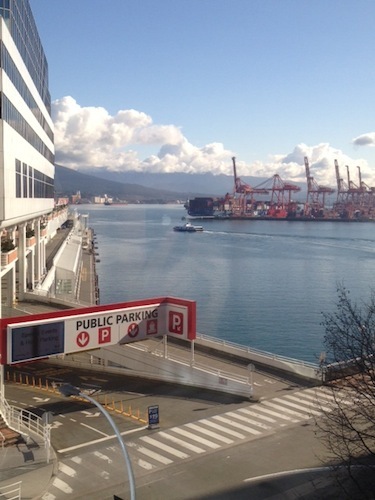 The Fairmont Pacific Rim, down the street, gets a lot of attention, but I am a devoted fan of the Fairmont Waterfront. We’ll be here next year!